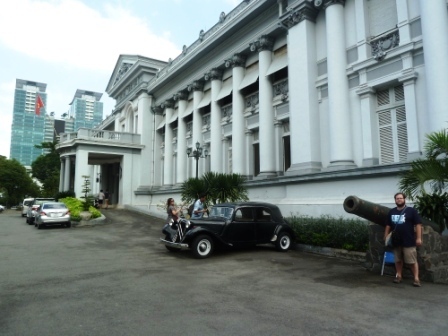 Our last stop in Vietnam was Ho Chi Minh City, still called Saigon by most of the people there. We had only 2 days there, so we explored what we could, mostly on foot. We saw the Independence Palace, the War Remnants Museum, and the Revolutionary Museum (which displayed artefacts of the multi-generational Communist struggle, first against the French, then against the Americans). We also saw several different places of worship. Communist Vietnam is really opening up, not only to entrepreneurship, but also to religion, allowing churches and other religious groups to apply to be officially recognized by the government. Still, many illegal churches still exist. In fact, the one we visited (at which Ryan preached) is in this later category! 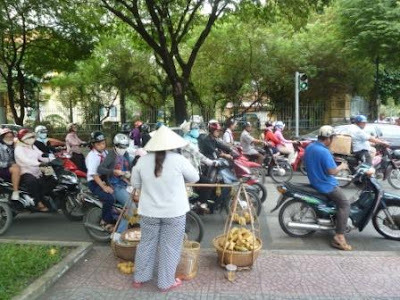 A vendor selling banana-leaf lunch packets to the people on their motorbikes. 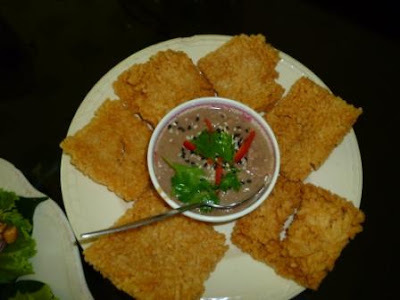 Truly life on the go. 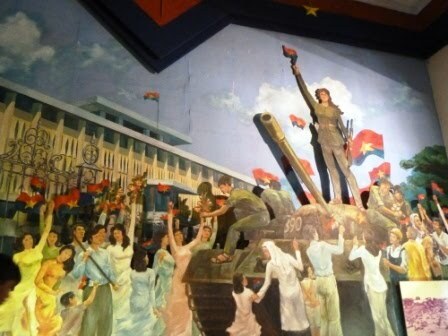 Mural representation of when the Viet Cong finally broke through into the Independence Palace. 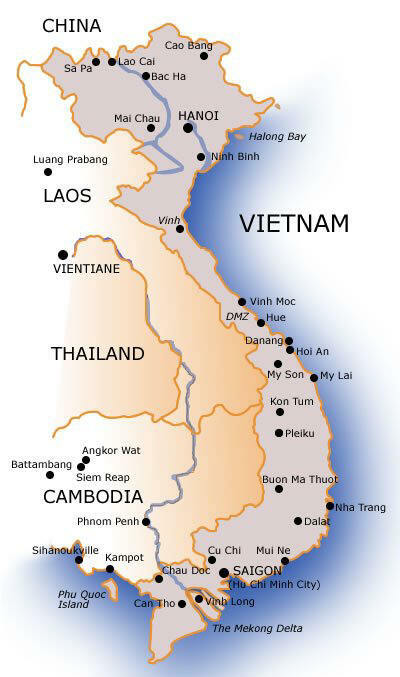 We spent 12 days total in Vietnam, from Oct 19-30. After Hanoi and Halong Bay, we traveled by train and bus down the coast. We enjoyed several days in the Central coast area, including the cities of Hue, Hoi An, and a brief stop in Danang. We continued down the coast toward Saigon, taking a couple days on the beach in Mui Ne (2 hours North of Saigon) before hitting the city. The largest stretches we traveled by train--by sleeper car. The first time we were in a "soft sleeper" which has 4 beds in a compartment (double berth, aka- two levels on each side). It is easy to sit up on these bench-beds during the day. The second train we took, this kind was sold out, so we were in a "hard sleeper," which has 6 beds (three berths on each side). The beds weren't really any harder in the "hard sleeper," you just couldn't sit up. We shared this compartment with a family--mom, dad, grandmother and little baby. They didn't really speak English, but we communicated with smiles and some sign-language. There is a toilet room and a wash room--with sinks, on either end of every train car. Some were "normal" toilets, and some were "squatty potties." All in all, it was quite comfortable. And unlike the train we took from Zambia to Tanzania, these ones had air-conditioning, and working lights and plugs (not all of these things worked on the TaZaRa train). 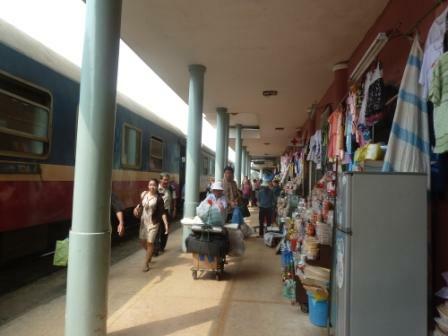 Train station as we arrived in Hue. We took an overnight sleeper train which was about 9 hours. 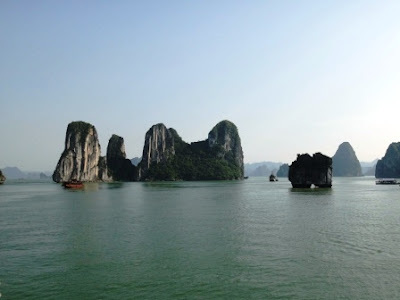 Our first stop in Vietnam was beautiful Halong Bay, on the North coast. There are 3,000 or more of these "karst formations", basically limestone islands rising from the emerald waters of the Gulf of Tonkin. We took an overnight boat trip on a Chinese junk boat to explore the waters, caves, hidden lagoons, and floating villages of this UNESCO World Heritage cite. 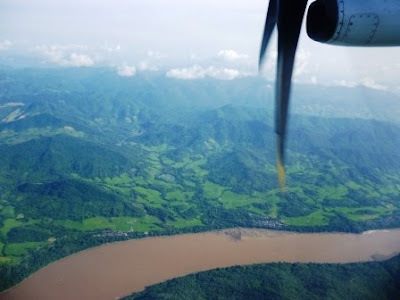 The landlocked country of Laos is a very mountainous country, full of rivers, many forests, and few people. We really enjoyed our time in the ancient city of Luang Prabang, which has been called the "most romantic city in Southeast Asia" by our guidebook. It was very relaxing and slow paced. 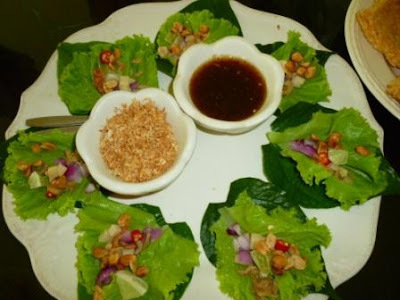 Miang Kham Lettuce (and some other, lemony leaf), with shrimp, peanuts, shallot, hot pepper, ginger & lime, to roll up and dip in tamarind sauce and toasted cocount. Khao tung Nah tung dried rice patties (like crackers) with a pork & peanut dip. The Dowell Baum Team is at home in Kitwe.